In the aftermath of the fall of the Galactic Republic, not all of her forces went to bolster the Alliance. Some, the brave few, instead chose to head to Wild Space, seeking old worlds that had once allied themselves with the Republic of the pre-Palpatine era. There the Republic would remain for its following years, observing from those that gave it shelter and its leaders breeding a new group to hold its standard. It is this group, these successors that return to the Galaxy and are welcomed as such. 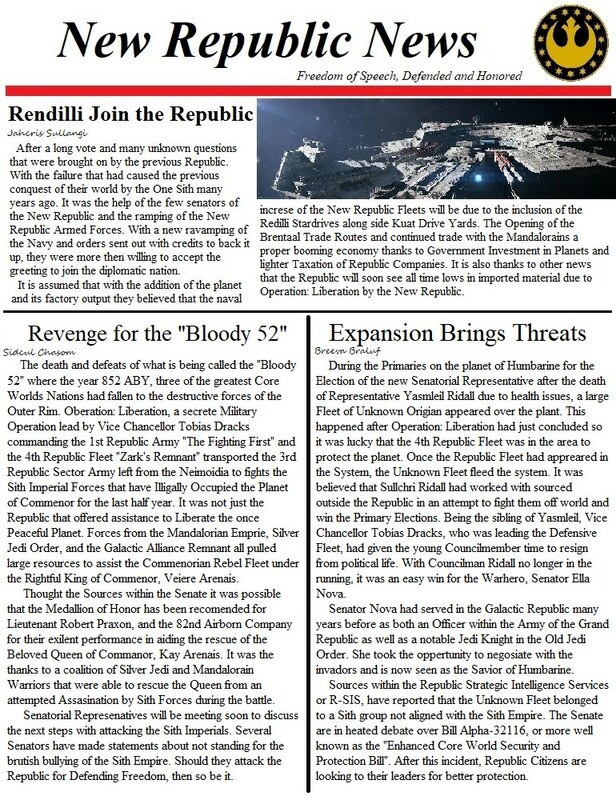 With its Capital on Carida, The New Republic exists to stand as an example of a better way to deal with the dangers of the galaxy. It does not sacrifice liberties and freedom, merely to bring order and protection, choosing to instead foster those ideals in its people. It does not give power to those with the force for being merely such, instead of leveling the field and requiring those with the force to actively work for their place. And it does not give power to the Jedi Order, merely housing it and nothing more. The Republic stands to provide a shining beacon, a shining light and a city upon a hill for any that would take their chance. It welcomes all those who would fight to protect those beside them and the people of the Republic. It does not conquer worlds or force people to bend their knees to it in absolution. It fosters all ideas and gives them a platform, letting the people of the Republic choose for themselves. Join today, defend those who would seek the light and a chance for true freedom. For The Republic! To start off, please do check active-threads for things to post to and plan in. We have several options at the moment, including the Dominion of Ebaq, where a droid beat them up like in KOTOR 2's start, or a artifact hunt with Alexandra is going on, or a base set up with people like @Faith Organa and @Nicole Sarah Feanor. Then there is the Dominion of Dremelue, where Beth Cadera is hosting a party/ball event for our more Diplomat focused people, with individuals such as @Lux Berooken there. Then we have the Faction thread on Fondor, a set up incase we need to move, involving the chance of the Chancellor being assassinated, the Ssi-ruuk invaders being fought, and the shipyards being restarted and people aided. Lastly, there is the Faction thread on Alderaan, where a memorial is held for the lost souls and heros of Corellia and of Kuat, both Republic and Allies, but also there is the beach party portion, people using happiness to dull the pain of losing their companions and fellow soldiers. Please, enjoy the threads and keep up the hard work. The Staff will not force us down and we will prove we are worth remaining major. Which beings me to the address of that Recall Vote. Possible Invasion and Next Dominion discussion. Let me get the big one out of the way. ICly, the planet of Coruscant and surrounding worlds are Allies of the Republic and worlds that we have pledged to protect. As of yesterday, the Imperials have decided to attack and claim the world as their capital, striking and subjugating our ally. Below is a vote on if we should do an invasion of them, assuming they get the Major Faction approved. Second bit of news for the day is our next dominion target being Duro and I ask of those here and on the discord to help discuss and figure out ideas and what you want to see as far as things to do in the next dom. Been trying to hear them more towards you guys, so any suggestions would be helpful. Upcoming Possible Challenge for the Faction. Hello Everyone, I come to you with a challenge. Should we complete Cambria, Brentaal, and W22 by next weekend, on the 27th, would the Faction want to attempt another go at the idea of trying to attain a SSD. We would do a very similar situation as we did for Corellia, opening the threads up to allies and enemies to fight against on Anaxes and Borleias while also keeping it open for people to join the trial for Reverance in Alderaan's dom. This would start on February 1st if we attempted it, with a simultaneous strike on Imperial Strongholds on Anaxes and Borleias while publically putting Reverance to trial. The Threads timeline wise would be spready a few days apart In Character so that one person could join all three on one character if they choose to. Thank you all for your time, and have a good next week. Looking forward to finally getting those doms done before the 27th, an upcoming birthday for me if that provides some encouragement to help me out and finish them. 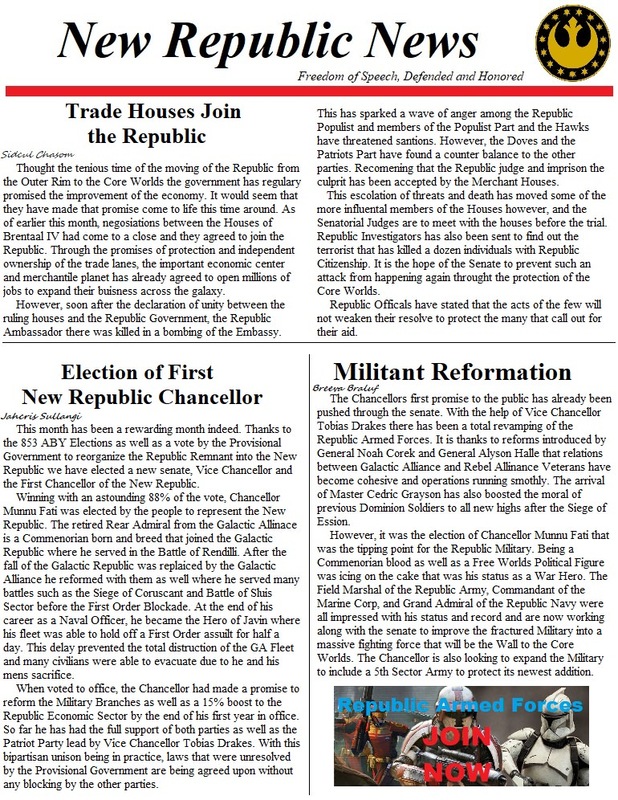 The End of October was a little slow so only one issue was released for the New Republic. Hope you all enjoy the light read. News Blog.